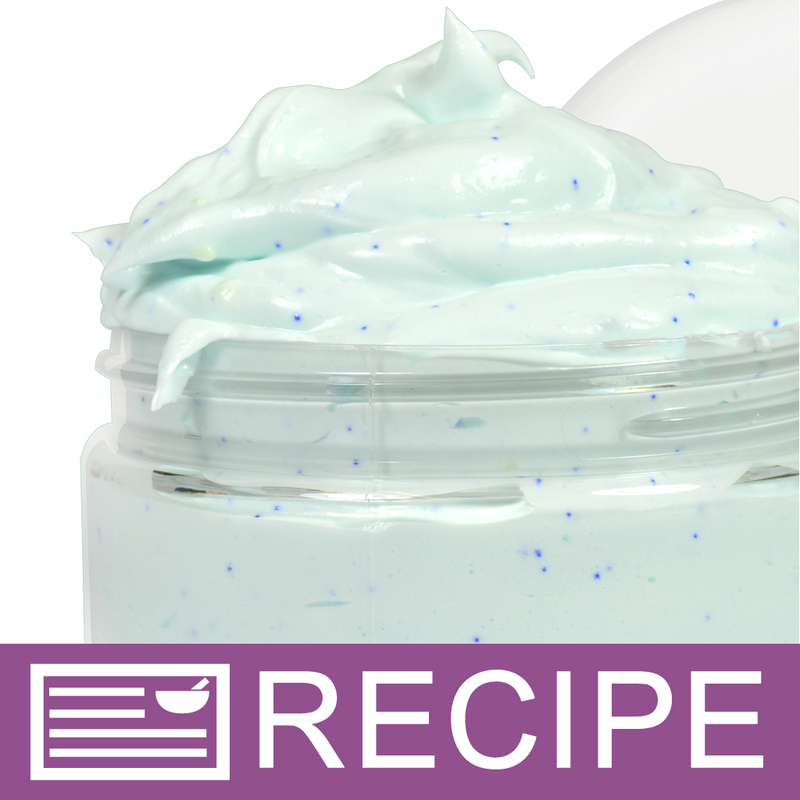 This project creates jars of blueberry scented bath whip. Use a large scoop of the bath whip under running water for a bubble bath or use as body soap on skin. The spa blue jojoba beads provide gentle exfoliating properties while the apricot kernel oil provides extra moisturizing properties. We love this product for summer. It’s a fitting product for your product line if you sell at farmer’s markets! You Save $10.15 by purchasing this kit rather than buying the items separately. Glycerin, Water, Sodium Cocoyl Isethionate, Sorbitol, Propylene Glycol, Disodium Lauryl Sulfosuccinate, Yogurt Powder, Sodium Laureth Sulfate, Glycol Distearate, Cocamide MEA, Laureth-10, Apricot Kernel Oil, Stearic Acid, Sodium Chloride, Diazolidinyl Urea, Iodopropynyl Butylcarbamate, Fragrance, Jojoba Wax, Ultramarines, Blue 1. COMMENTS: The kit was fun and easy to use. Directions were very easy to follow and were precise. Great for beginners. Enough product to add and make again w/a different fragrance. "Blueberry Bath Whip Making Kit "
COMMENTS: Very easy to make. The product came out wonderful. Makes your skin feel smooth and soft. The blueberry scent smells wonderful. "Hello, What is the shelf life of this product? Will it melt if kept in bathroom cabinet? Also what about the life when shipping? Does it melt?" Staff Answer Once a product is made, it has a shelf-life of one year. It will not melt if kept in the bathroom but can soften and possibly melt if in a UPS truck for 3-4 days in transit during the summer months. "What ingredient has the Propylparaben in and can it be substituted for a different preservative?" Staff Answer It is actually the colorant Stained Glass Ocean Blue Liquid Color that contains the Propylparaben and it can be substituted for a powder color. "The day I make these, it looks just like your pics..but next day, my whips thicken up. why is this. " Staff Answer This product naturally thickens as it dries. The yogurt powder in this is eating the water in the bath whip base. To combat this, I've had success with increasing the oil or reducing the yogurt powder. the finished product is a little dense when you make it exactly as described. I hope this helps!